One of the questions I just got from the Instagram stories is – What’s your favorite protein bar? Well. I couldn’t answer that in one story reply because I wanted to show you which ones I like for different snack situations. And I wanted to list my favorites related to when is the best time to eat them. But these aren’t straight up the best solely based on nutritional information. Some of the bars have a long list of ingredients. Yeah. But I don’t want to eat anything I don’t like just because of 1 rule or old food rules I used to hold myself to. 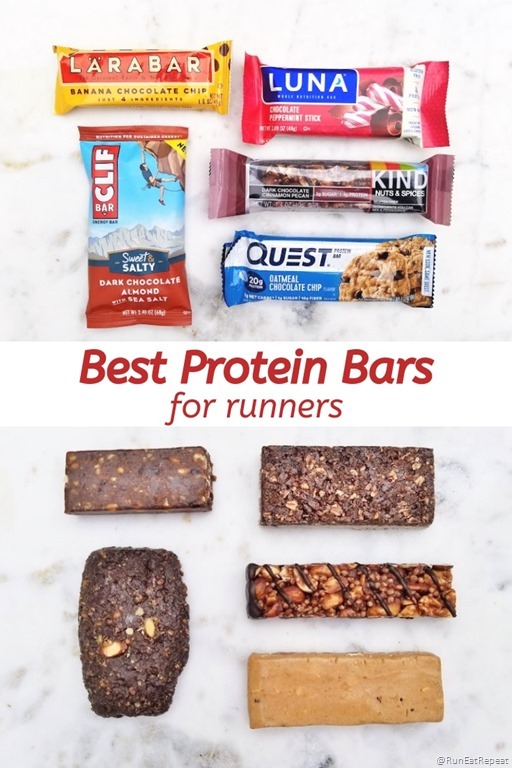 So this list of protein bars for runners are my picks for taste and macros that work for me. Consider your nutrition needs, body and timing for the best ones for you. > Pre-run go for bars that are higher in carbs and lower in fiber and fat so it’s easy to process fuel for your body. > Post-run choose bars that have a 3 to 1 or 4 to 1 protein to carbs ratio. This means bars that are about 3 times higher in protein compared to the carbohydrates. If you don’t have a high protein bar – pair a granola bar with something protein rich. > Training can make you hungry! So it’s a good idea to keep healthy snacks on hand. I’m breaking down the list from top left. Best Protein Bar for – Pre-Run fuel. The ingredients are just dates, almonds, bananas and chocolate chips. Basically it’s similar to a banana with almond butter and chocolate chips. So if before a run you grab a banana and scoop of nut butter – this could work too. It’s very banana-y and I like that! Best Protein Bar for – Post-run or Anytime Snack. This tastes like a cookie so I love it for a mid-afternoon treat. It should have a little more protein for an ideal post-run snack so pair it with milk to balance it out. This flavor is available year ‘round and it’s my favorite Luna Bar flavor but it’s inspired by peppermint bark a treat normally around during the holidays. If running makes you Hangry this is a good pick. It’s delicious and the higher fat content of this bar makes it very satisfying. The dark chocolate Kind bars remind me of fancy boxed chocolates. This is a true protein bar with 20g of protein. This is one of the few options with protein content similar to a protein shake. The Oatmeal Chocolate Chip is my new favorite. I used to be OBSESSED with the Chocolate Chip Cookie Dough bar and buy them boxes at a time! Quest Bar Hack: Pre-heat oven to 350 degrees. Cut the bar in 4 pieces. Flatten them a bit (I just put them in my palm and press slightly). Bake for 6 to 8 minutes or until they are rising and setting. Careful – they’re hot! But if you enjoy them when they’re still warm they taste like a freshly baked chocolate chip cookie. If you let them cool they’ll crisp a bit and are still good. Note – the ingredients list of Quest Bars are a little longer than some of the others on this list. I’ve loved Quest bars for years but the high fiber content and sweeteners can upset sensitive stomachs. Try one or two before buying a whole box. This is a great pre-run or pre-workout bar because it’s a little higher in carbs and lower in fiber. It can also work as longer run fuel too. There are tons of flavors and similar Clif Bars aren’t coated in chocolate so they won’t melt in your bag. They’re also available in so many places – convenience stores, grocery stores, Target, Whole Foods, airports… So if you are traveling for a race or while training you can grab one on the go. These are just the top 5 protein bars I grab most of the time but I also love RX bars and a lot of other ones! Next Who Races Up the Empire State Building? I Did!